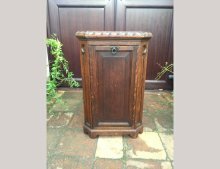 A Gothic Revival oak coal perdonium with carved top and carved linen fold panels to the sides, in the style of A.W.N Pugin. Height 25", Width 16", Depth 14". A.W.N Pugin attributed to, for the 1st Earl of Lovelace, who was raised to that peerage in Queen Victoria's Assession Honours list of 1838. In 1835 he married Ada Byron, only daughter of the celebrated poet Lord Byron. She was an important figure, a mathematician and writer, who is known for her work on Charles Babbage's early mechanical computer and is often regarded as the first computer programmer. The 1st Earl of Lovelace acquired Horsley Towers in Surrey, built by Sir Charles Barry who collaborated with Pugin on the Houses of Parliament. Lovelace set about expanding it in the Gothic style in the 1840s. This desk probably traces its roots back to this agrandisment. Height 31" , Width 60" , Depth 34". A.W.N. Pugin. 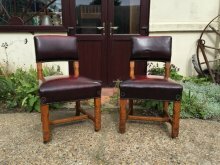 A large pair of oak dining chairs designed for the Palace of Westminster. 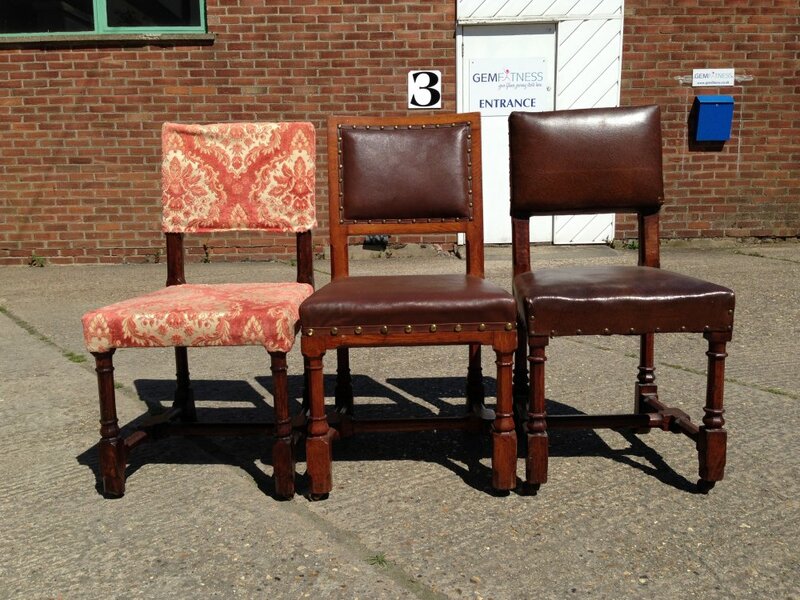 Three almost identical sets of Gothic Revival oak dining chairs designed by A W N Pugin for The House Of Lords and made by Gillows of Lancaster. Stamped Gillows to the back legs. 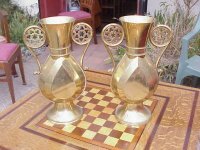 Super quality and all in excellent original condition. Consisting of : one set of 4 in red upholstery and two sets of 6 making a total of 16. The first line of images show one chair from each set together for comparison. I will sell as separate sets. 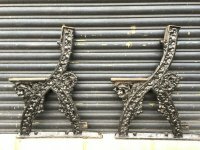 A rair pair of early Gothic Revival cast iron garden bench ends designed by A.W.N. 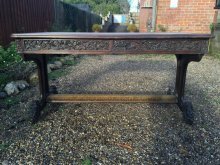 Pugin with foilate details which is somewhat hidden at the moment due to many coats of paint over the years but this will show much more detail once they have been gently bead blasted and powder paint coated. The last image here is to show how it can look when seating slats have been made. With or without wooden runners to the feet. A.W.N Pugin. 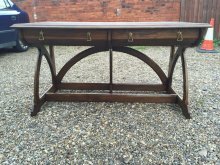 An important early oak desk. Circa 1845. A.W.N.Pugin. 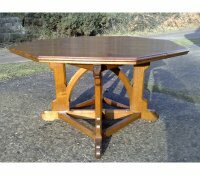 An outstanding oak centre table designed by Augustus Welby Pugin and almost certainly made by firm John Gregory Crace. Height 30 1/2", Width 52", Depth 52". Circa 1847. 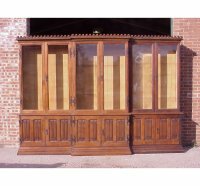 A monumental stunning Gothic Revival Oak breakfront bookcase attributed to E.W. Pugin and possibly from Scarisbrick Hall in Lancashire of superior quality with wonderful proportions, an amazing work of Art, a real hybrid in the true Gothic Revival taste and certainly a commissioned piece. 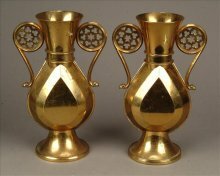 A pair of Gothic Revival brass flower vases designed by A.W.N. Pugin with stylised pieced handles and engraved 'St Mary's Parish' to the base. Measurements Height 14", Width across handles 8". Circa 1895. 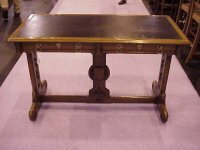 A Gothic Revival two drawer leather writing table after a design by A.W.N.Pugin and probably made by Gillows, this desk is consistent with furniture he designed for the Houses of Parliament and the New Palace of Westminster, exposed through pegged joints, crisply carved oak leaves entwined in linen fold scroll with further rose florets, gilt brass handles and escutcheons, inset brass castors. A well balanced functional piece. Height 30", Width 4', Depth 24". Circa 1860's. 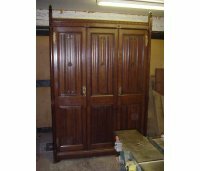 An important Gothic Revival oak treble wardrobe of superior quality designed by Pugin and probably made by Crace with castelated cornice with elongated sides with seed pod carving and further carved rossettes to the linen fold carved door panels with fantastic brass handles and hinges the doors opening to reveal hanging space to the left hand side and a storage box with lift up lid below and to the middle and right hand side is 2 over 2 drawers and 3 open linen drawers to the upper section. Height 91", Width 62", Depth 22". Circa 1880's.